INTERVIEW: 85A on Cargo, Camera…ACTION! On Saturday 26 July, 2014, Glasgow Film presents “a day-long cinematic spectacular” on the Clyde, a celebration of cinema and the city in collaboration with local arts collective 85A. After a launch event at Glasgow Film Festival 2014, 85A are gearing up for a multimedia, multi-disciplinary extravaganza that looks likely to eclipse their celebrated previous projects Chernozem: Kino and Jan Švankmajer. I spoke to 85A ahead of the event and for a “faceless, non-hierarchical organisation”, they were very forthcoming. An edited version of this interview first appeared on the Glasgow Film website. Can you explain what 85A is, and introduce the key players? We’re a group of multi-disciplinary artists who love to put on the kind of events that we’re personally craving, but that really just aren’t about in Glasgow. It generally involves generous servings of loud music, puppetry, masked performances, irreverent audience interaction, site-specific logistics, and a lot of film too. We have created 19 shows since 2008. There are about 12 core members, with many more associates that join in on a project-by-project basis. We also like to produce work from within a faceless, non-hierarchical organisation. How did 85A come to be involved in this project? Glasgow Film approached us to be part of their bid for Festival 2014. After the brilliant 2012 Glasgow Film Festival event that 85A organised at the Glue Factory – which featured over 10 site specific micro-cinemas showcasing the work of Czech animator Jan Švankmajer – it was a great chance to contribute to the brief that aimed to transform underused locations along the Clyde promenade into film screening spaces…an opportunity not to be missed. 85A have got a bit of history with building cinemas in unexpected sites. Our very first project was the screening of Stellan Rye’s Der Student von Prag with a live, musical re-scoring, in a disused ice cream van garage in Partick. We went on take over The Old Hairdressers, well before it re-opened as a functioning bar, for our submarine spectacular, The Orzel Film Performance. 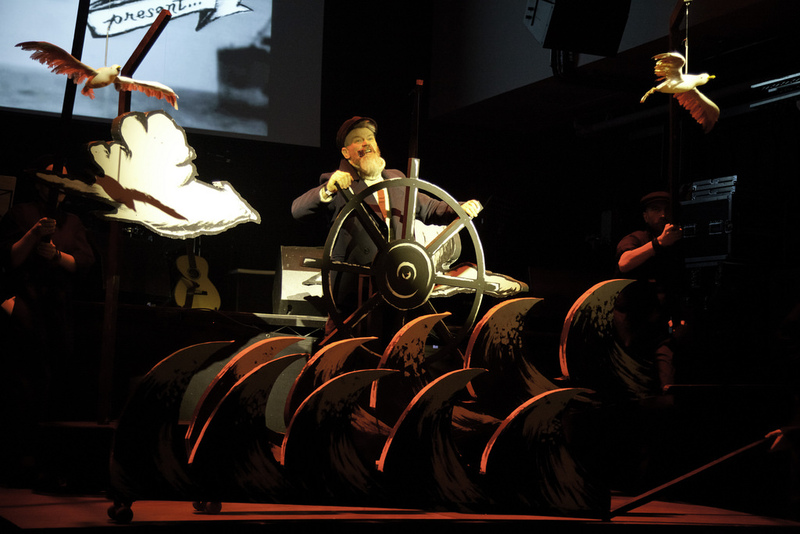 We had audiences of 50 packed inside an elaborate cardboard set of a WWII Polish sub, all the while watching this 1958 masterpiece as a live crew of musicians and folly artists created the soundscape. Participating artists have been reportedly been asked to look through a cinematic lens at the city’s history of shipbuilding and shipping, and at the history of sport throughout the city. How did you approach this? What kind of technical challenges has it presented? The main challenge of this project was to conceive an outdoor cinema event on a day where it wouldn’t be dark until 10pm. As such, we didn’t want to keep the audience in a tent or sit in front of a big LED screen. Glasgow Film had secured the amazing Clyde amphitheatre location for the event and we wanted to create a buzzing, celebratory atmosphere along the busy promenade. The solution was to turn the brief on its head and look at cinematography through a performative lens, and create a show about a madcap film shoot, enabling us to look under the skin of cinema and the shipping history without using a screen. With the Clyde as a backdrop, the cargo ship was an obvious choice for the set as it created a natural link from the city’s history to many classic sea themed movies. At nightfall, our ship will become a spectacular cinema space with a two-hour screening programme. Between 10pm and 12am we will be complementing the commissioned artists’ films (by Chris Leslie and Torstem Lauschman) with some amazing documentaries from the Clyde’s shipbuilding heydays – featuring equal measures of brilliant footage of human endeavour and mighty industry. We’ll also be showing early work by New Orleans filmmaking collective Court 13 (makers of Beasts of The Southern Wild) who worked with the remains of Hurricane Katrina as a set, and destitute communities as actors – it’s great stuff. What kind of research did you undertake, and where did you draw inspiration from? As a group, our filmic influences are diverse, including Expressionism; surrealism; documentary filmmaking; indie productions; low budget horror, and the likes. We’re not into blockbusters or anything featuring bearded wizards with pointy hats. Between 2011 and 2013 the whole collective intermittently worked on producing Judd Brucke’s Chernozem, an industrial-horror tale featuring a man with a factory for a head who escapes a chain gang…filmed entirely on VHS with a degraded black and white finish. We collectively scoured Glasgow’s iconic wastelands as a makeshift film crew, filming, lighting, making sets and costumes, directing and acting in equal measure… sometimes with often highly comical or disastrous consequences along the way – a thoroughly better process to learn about cinema than mechanically going through the 100 Must See Movies Before You Die! Setting up a tracking shot or your own SFX really gives you a new understanding of filmmaking. This first-hand experience became the core of our research and it’s this appreciation of cinematography that we’d like to share with our audiences this summer. Cargo, Camera…ACTION! is an ode to low-budget filmmaking and taps into the electric atmosphere of the film set environment. As the project developed, we picked up on some seminal anecdotes, such as the famous Werner Herzog vs Klaus Kinski bust ups; the genius of special effects inventors like Ray Harryhausen; or even the real life production drama about Terry Gilliam, Lost in La Mancha. But we’re also commenting on the current state of film and TV with game show style audience interaction and invasive product placement funding strategies. How does it tie thematically and practically to your previous projects, if at all, and how does it differ? We placed particular emphasis on remaining true to our style for this show despite being part of such a mainstream event, so Cargo, Camera…ACTION! will be 85A through and through, in all its glorious madness. Having developed in the visual arts scene, we’re very aware of how elitist and alienating high art can be, but we’re fighting against this and are thrilled to be planting the black and white 85A flag right in the middle of the commonwealth promenade, bringing the party to a truly diverse audience. How do you anticipate audience participation or interaction at events and how do you deal with it if it’s not built-in to the event? Whether pushed along in trolleys, given wheatgrass haircuts, asked to pelt our giant puppets with seed bombs or crushed into a trap door, audiences truly have an active role at every 85A show. For Cargo, Camera…ACTION!, the audience will be cast as film extras for our pretend shoot, and in turn, will be required to help during some of the scenes with some very important tasks! And whilst waiting to get ‘on set’, the extras will be able to relax at our “backstage” cafe where the film shoot atmosphere continues, including: a tasty catering trailer, crew bar and an all day “wrap party”; DJs playing cinematic soundtracks and games; and a roaming make-up crew with talent scouts who will be preparing our fine extras respectively before their big scene. Can you tell us more about the “upbeat global sounds of dynamic bands and DJs”, and how they fit into the whole event? All of the bands will provide the focus for the show and are integral to its narrative. Our daytime show will run five times – featuring a different soundtrack every time – with the musical bill being shared by some of the most exciting Glasgow bands in a variety of styles: Dub champions Mungo’s Hi-Fi with special guests New Dehli’s Reggae Rajas; newly formed surf-rockers Halfrican; veteran seven-piece ska outfit Capone & the Bullets; musical maestros Gypsy Romania from Govanhill; and hypno-psych voodoo groovers Golden Teacher. Basically, audiences can see the show with the soundtrack of their own musical choice! And in the Café Bar, the groovy, eclectic and cinematic soundtracks will continue with the exceptional host DJ Afrodeesia and guests. How do you recommend audiences prepare for the performances (and to be “flabbergasted”)? Even though this will be the height of the summer, this is an outdoor event in Glasgow, so we’re preparing for a “rain or shine” show, and audiences should do the same. To make the most of this sea voyage as well, outfits in tones of blue/green/grey/black/white are highly recommended. However, once the filming starts, anything can happen – so all our extras should be ready for their action packed 15 mins of fame! Tickets for Cargo Camera…ACTION! are free and go on sale on Thursday 26 June. Keep checking glasgowfilm.org for details. This entry was posted in GFF 2014, GFT, Glasgow, Interview, Movies and tagged 85A, Festival 2014, GFF, Glasgow, Glasgow Film, Glasgow Film Festival, Interview. Bookmark the permalink.